The chances of recovery for paraplegic patients were once considered nearly nil. But in 2014, 29-year-old Juliano Pinto, who faced complete paralysis below the chest, literally kicked off the opening match at the FIFA World Cup. Researchers had created a brain-machine interface (BMI) that allowed Pinto to control a robotic exoskeleton for the symbolic kickoff at São Paulo’s Corinthians Arena. 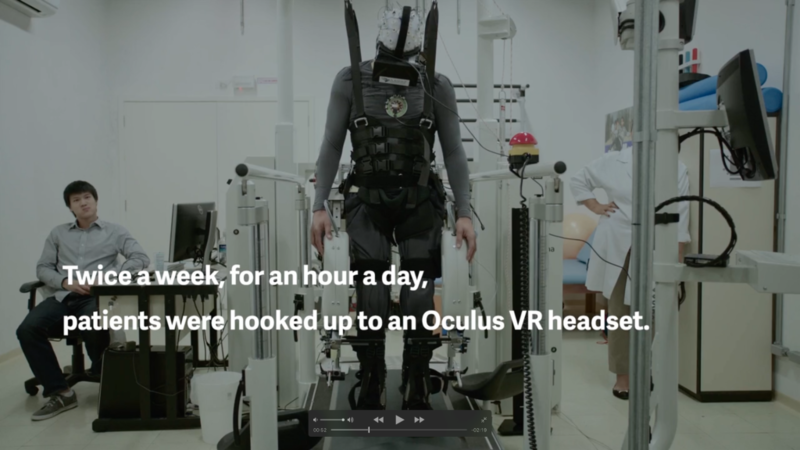 Fast forward two years, the Walk Again Project (WAP), the same nonprofit international research consortium that designed Pinto’s exoskeleton, is now using virtual reality to help paraplegic people regain partial sensation and muscle control in their lower limbs. According to a study published Aug. 11 in Scientific Reports, all eight patients who participated in the study have already gained some motor control.